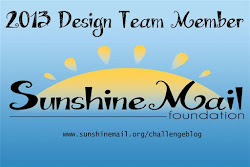 Smiley Guy Designs: Many Thanks! Hope everyone had a wonderful Valentine's Day. Now that Valentine's Day is over it's time to move on to something else. 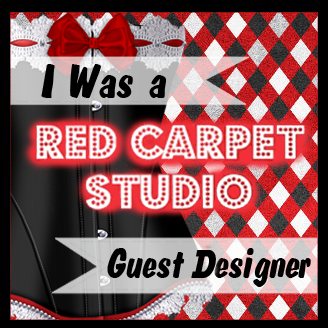 The cards I'm sharing today have to do with projects I submitted to CardMaker Magazine last year. The projects had to do with a color challenge. The magazine picked several colors to be used on projects. The colors were brown, orange, olive and turquoise. The colors all go well until you get to the turquoise...wow! I was lucky enough to find 2 patterned papers that had ALL the colors in it. This first card uses the Stampin' Up two-step Owl punch which I love, love, love! It's so freakin' cute! It's hard to tell but the dark stripe on the left is brown...not black. The owl's little shirt is one of the patterned papers with all the colors I found. This is a cute, simple card.....but not chosen for the magazine. 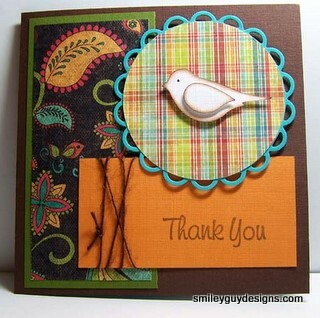 The next card also uses a Stampin' Up punch - this time the two-step bird punch. Not quite as simple as the first card. The turquoise circle is a Spellbinders 'Lacy' circle die. 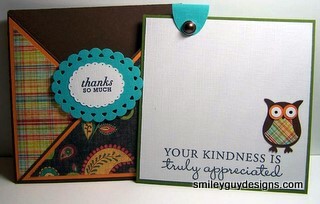 I like the patterned paper for this card - you see both of them and they don't look bad together. This is a cute card too, but again....not chosen for the magazine. This third card is a little more detailed. It's called a criss-cross pocket card and very easy to make. I saw a couple of youtube videos and really liked it so I decided to give it a go. The turquoise piece on this one is also a Spellbinders die but this one is called 'Beaded' circle. This is what it looks like open....cute huh? 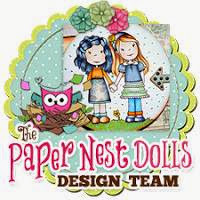 and................this one WAS CHOSEN to appear in the CardMaker Magazine November 2011 issue. This was actually my fourth card to be published by this magazine. My first card was already included in one of my first posts (Hanukkah waterfall card).....I'll post my second and third cards in a later post. Well, that's all for now - thanks for stopping by and I'll see you again soon!